LVCT Health’s award winning one2one youth hotline provides free information on HIV and AIDS, sexuality, sexual reproductive health and rights in a confidential and non-judgmental way over the phone. It is the only youth sexuality and sexual health toll-free hotline in Kenya and the largest in East Africa. The peer-led hotline targeting young people aged 15-24 years was established by LVCT Health in 2006. In 2011 LVCT Health signed a partnership with Safaricom, one of Kenya’s largest telecommunications companies, to expand the hotline. The hotline is now hosted at Safaricom’s Jambo Contact Centre, which has significantly increased the number of calls and improved quality management systems. Last year, nearly 260,000 calls were made to the hotline – with the majority of callers (64%) seeking information on pregnancy and birth control. 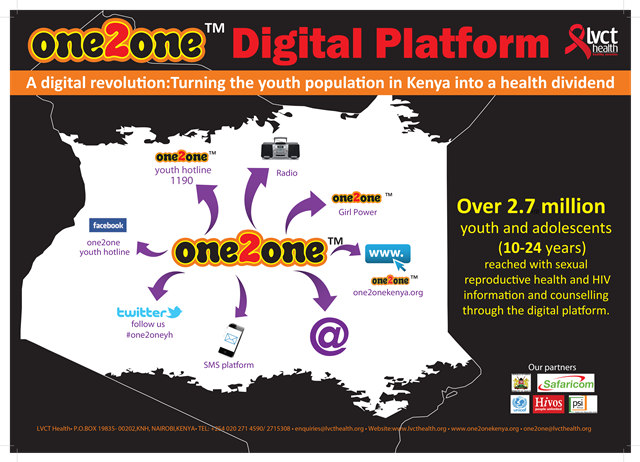 Other digital platforms – Twitter, Facebook, SMS and the website were also used to reach over 2.7 million youth.Call the hotline 800 720 121 (toll-free) from 8 am – 10 pm Kenyan local time.